Engine skylight and stack/ventilator component at the Oshima shipwreck site. Credit: NOAA/Schwemmer. 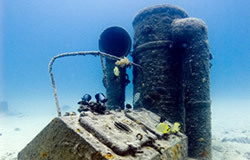 The site of an unidentified wreck fishing vessel at Pearl and Hermes Atoll was discovered by NOAA divers in 2004. The Coral Reef Ecosystem Division of NOAA's Pacific Island Fisheries Science Center has supported the removal of drift fishing nets from the fragile reefs of the Northwestern Hawaiian Islands for a number of years. Annually, teams of "marine debris" divers visually survey high impact zones in the distant atolls, cutting these nets away and removing them. These are the same teams who discovered the British whaling wrecks Pearl and Hermes at Pearl and Hermes Atoll. In their work to restore the ecosystem, they also occasionally report on other types of "debris." 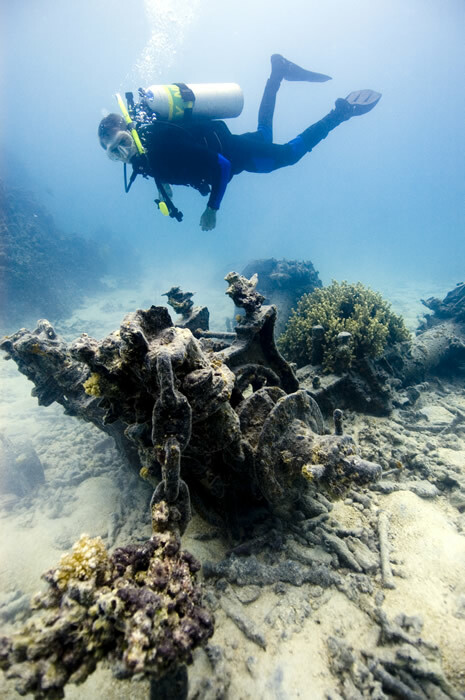 In 2006 the maritime archaeology team had their first chance to check on some wreck components reported two years earlier. Sean Corson swims above a windlass at the Oshima shipwreck site. Credit: NOAA/Casserley. 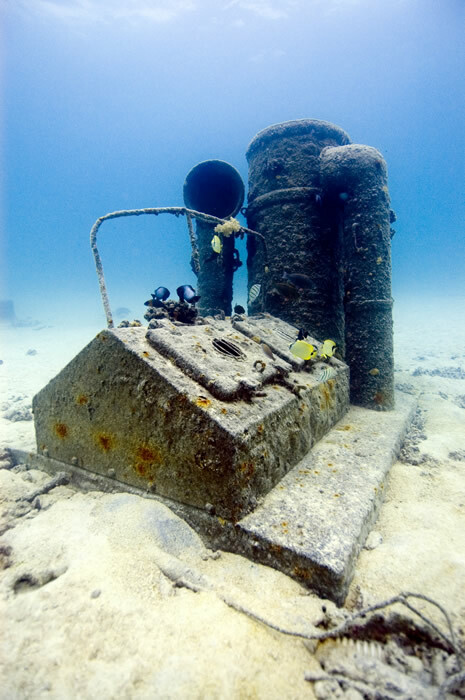 Inside the northern section of Pearl and Hermes Atoll, divers found three major artifact areas: 1) bow area with windlass, observation "tuna" tower, ventilators and both hawse pipes and anchors (Japanese "Oshima" design dating to 1918...hence the site nickname); 2) cook stove area with remnants of battery boxes and insulators and electrical components and also marine head; and 3) engine skylight area, an intact deck skylight and main stack and ventilator component, along with scattered ventilator parts, pipes, and miscellaneous artifacts. Sedimentation rate at this site appears high, and there are indications of considerable material beneath the silts of this low energy back reef site. Electrical components exhibit Chinese characters, and insulators are marked with "H.K." emblem (possibly meaning "Hong Kong"?). However, no engine, propeller, or lower hull components were witnessed at this location. The remains lie in approximately 20 feet of water, on a sandy silty bottom. Patch reefs are in the vicinity, but there is little to no coral cover on the site itself. 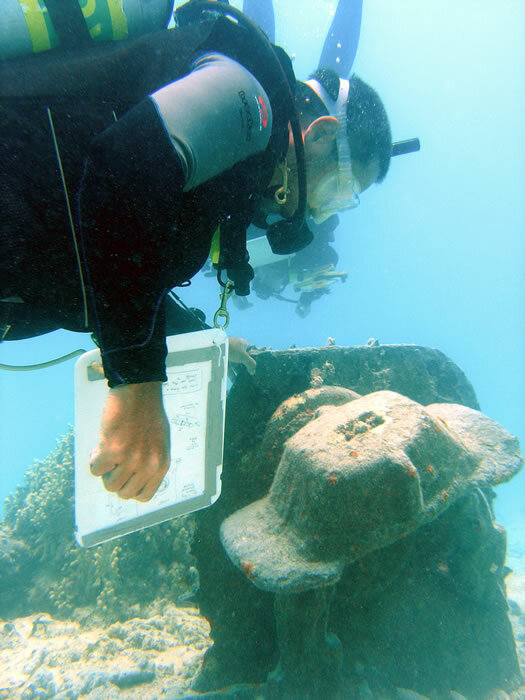 The shipwreck site located in the northern atoll area is in the general vicinity of a more familiar local landmark known as the "engine block." The engine is, in fact, a six-cylinder Atlas Imperial diesel and machinery scatter, propeller shaft and propeller, a marine propulsion plant popular in the early decades of the 20th century. Coincidentally, the engine block site at the reef crest shows no sign of any deck equipment or upper hull features, just machinery. Hans Van Tilburg investigates hawse pipes and anchors (Japanese “Oshima” design). Credit: NOAA/Schwemmer. Are these two elements of the same vessel? The archaeologists also discovered a debris trail of parts leading from the engine block into the lagoon. The findings suggest one possible scenario: an East Asian fishing vessel strikes the northern reef crest at Pearl and Hermes under power (propeller blades all bent). 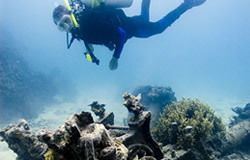 The bottom is torn out of the vessel, dropping the Atlas Imperial engine, and the wreck is pushed or drifts further into the lagoon where it sinks after striking two large coral heads (vicinity of site), sometime after 1918. This assumes the two sites are associated, which has not yet been confirmed. The fate of the crew is unknown. Did they abandon ship at the first impact, or remain on board into the lagoon? 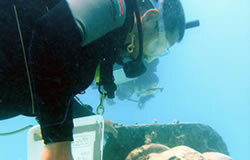 The 2006 team of maritime archaeologists who visited the site recorded artifacts and features, took photographs and collected the measurements and data necessary to complete a site map of this mystery fishing vessel. 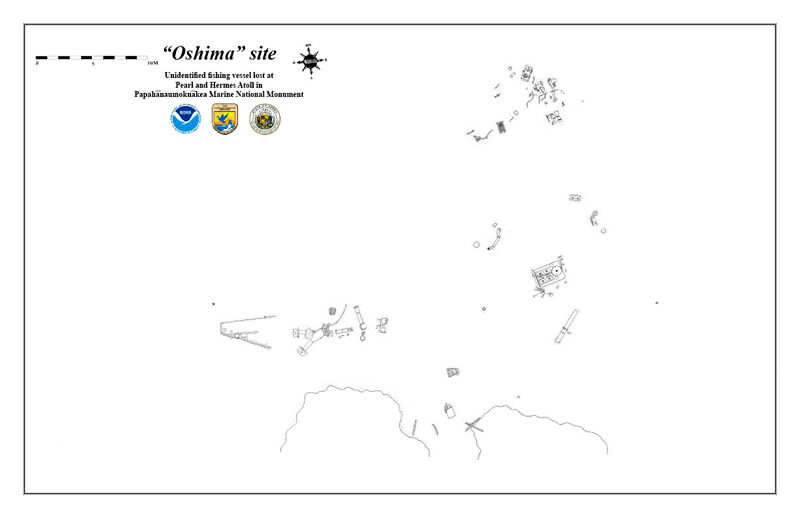 “Oshima” shipwreck site plan completed in 2006.